Long-haul arrivals in Western Europe are on the increase – showing its resilience in the face of last year’s terror attacks. It has taken over a year to recover, but long-haul arrivals are starting to surge again, reaching visitor numbers higher than those seen before the Paris attack in November 2015, reports ForwardKeys. The latest global overview of air travel has shown that passengers, from Europe, the Americas and the Far East, are making more bookings and taking more flights, despite recent terrorist attacks and on-going geo-political wrangles. That's according to ForwardKeys which predicts future patterns by analysing 16 million booking transactions a day. The findings it presented at the World Travel and Tourism Council's Global Summit, the highest-level annual gathering of travel industry leaders in Bangkok, Thailand this week included the observations that Canada is the new star destination in North America; Europe is recovering from last year’s terrorist attacks - arrivals growth is back on track; political events can have a major impact on the tourism industry: the Chinese turn their backs on South Korea, and explore ASEAN countries instead; and the BRIC countries are back: Brazil and Russia lead the growth. Thailand benefits. 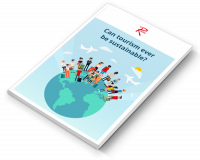 "This overview reveals the resilience of the travel industry globally. People are finding alternative new destinations, and they are returning to others, previously blighted by dreadful events. However, in a world of shifting travel patterns, businesses that depend on travellers need to be able to readjust ever more quickly," said Olivier Jager, chief executive officer, ForwardKeys. The data shows that in the Americas, Canada and Mexico are setting the pace for long-haul arrivals. The Netherlands, China, the UK, and Germany are fueling the additional forward bookings to both countries. The US suffered a decrease in visitors in the first quarter of this year - uncertainty due to Donald Trump’s travel ban and the stronger value of the dollar may have discouraged Middle Eastern (down 9.5 per cent) and European travellers (down 6.5 per cent). Forward bookings to the US have picked up, mainly due to Easter shift, notes ForwardKeys. Long-haul arrivals in Western Europe are on the increase – showing its resilience in the face of last year’s terror attacks. It has taken over a year to recover, but long-haul arrivals are starting to surge again, reaching visitor numbers higher than those seen before the Paris attack in November 2015. China’s power to make or break a destination is demonstrated by the recent trend in visitor numbers to South Korea. Beijing’s anger at the stationing of US THAAD missiles in South Korea is having a marked effect. ForwardKeys’ data reveals international arrivals in South Korea, for stays of four to eight nights, fell ten per cent in the first quarter of this year due to cancellations by Chinese tour groups in March. Forward bookings for the same category are currently lagging 28 per cent. ASEAN countries are the most likely to benefit from South Korea’s visitor crisis – as they certainly have the increased capacity for visitors from China. The BRIC countries are travelling again in bigger numbers – Brazil has been on the up since the end of its political crisis in 2016, and Russia had its first positive monthly performance, in December 2016, since its annexation of Crimea in March 2014. Both countries’ currencies are recovering in value – indicating more travel to come. The ForwardKeys data also delivers some interesting insights into markets. Forward bookings show that four out of five of the top increasing destinations for Brazilians are in Europe. Indian travellers prefer Asia Pacific. Russians like Georgia, Czech Republic, UAE and Italy. Turkey’s big increase is due to Russian travel sanctions the previous year. Thailand is benefiting from the BRIC boom. It’s helping to fill a gap left by a reduction in Chinese visitors after the Thai government discouraged cheaper tour groups from China from September 2016. “In summary, Europe is recovering, the BRIC are back, Canada is a rising star and Thailand has made a very positive start to the year. However, the deployment of THAAD missiles in South Korea has torpedoed its inbound tourism industry,” added Jager.